My Lovely London' cross stitch kit celebrates Harry Beck's1930's, iconic London Underground map, a design classic, synonymous with London life. I've strives to stay true to the original design, simply tweaking the colour pallet to make the finished image more restful to the eye. once finished on 16 count Aida the design measures 14cm x 16cm. The kit contains functioning embroidery needles; therefore the recommended age for this kit is 12+ years. 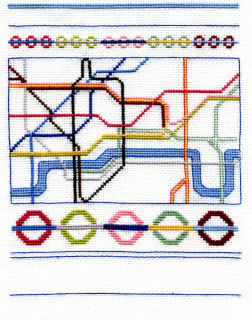 Once finished the stitched image is 15cm x 16cm.